Soccer has never been nastier! 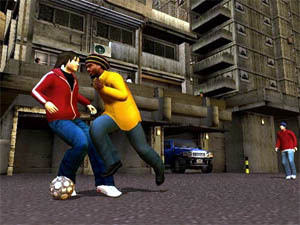 Urban Freestyle Soccer is the next instalment of "street" games from developers Silicon Dreams that gave gamers a unique perspective on basketball in NBA Street. This time the developers have targeted street soccer and give gamers the choice of playing 4 on 4 in some of the meanest and nastiest soccer of the English ghettos. Rather than playing world famous soccer teams like Brazil or Manchester United, gamers get the chance to select their player from a choice of up to ten different street gangs that not only displays your prowess but also helps give your gang that winning edge. Urban Freestyle Soccer features a variety of urban gaming environments that have successfully replaced the professional soccer stadiums of Europe and removed certain rules such as offside penalties and contact that truly makes this soccer game quite unique. Silicon Dreams also gives players the option of five different gameplay modes such as Turf Wars, Freestyle, Home Turf and Street Challenge Cup to help cater for a variety of different styles of play. 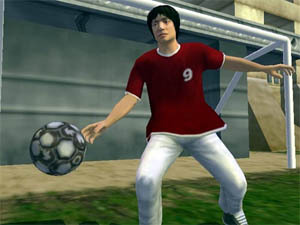 Although many soccer titles on the PS2 are quite simply brilliant, they do become a little repetitive but this is not the case with Urban Freestyle Soccer as it increases the playability of this title by including mini-games, hidden power-ups and even an in-depth combo system that allows players to earn skill points for team upgrades. The control system of Urban Freestyle Soccer uses a combination of the left analog stick to control your player with the d-pad used to perform a variety of manoeuvres with the shoulder buttons used to perform the special moves. The control system really comes into its own when you start performing various real-world soccer moves such as scissor kicks, juggling and even back kicks that help spice up the gameplay of this title. Although the game virtually lets players perform a plethora of moves, the novice gamer will have no problem in mastering this title in no time. Whereas the more seasoned veteran gamer can start playing almost immediately and will have no difficulty in performing the "super" moves of the players. One of my favourite super moves is the net buster that basically "slams" the ball into the net at super high speeds that not only looks like a visual treat but is quite effective. Although in all soccer games you only interact with the other players in the game, Silicon Dreams have also included interactivity with non-interact objects such as walls, tyres and even trash cans. These objects can also be used to perform various moves such as back flips, kicks and trips or allows you to throw them at other players. 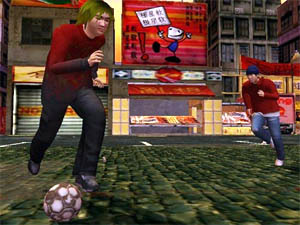 Graphically Urban Freestyle Soccer is a visually impressive game that doesn't suffer from any drops in frame rate or other graphical glitches. The only slight annoyance that this reviewer can find in the title is that sometimes the camera takes awhile to catch up to the action of the game. The gaming environments are extremely well designed and contain some realistic texture details from bricks, garages and even graffiti that is littered throughout the game, from industrial zones to housing estates, the developers have done a brilliant job at recreating the urban settings of England. Apart from the great gaming environments, the players of the title are also well modelled and move with human-like grace and fluidity that not only contain a high polygon count but also have realistic texture details for that real-world look. Although the most impressive feature of the game are the specialised trick animations that the players perform, quite simply said... they look remarkable. 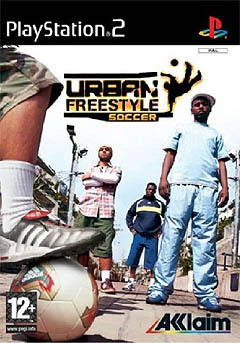 Urban Freestyle Soccer also contains a "kicking" soundtrack that contain the Foot Fighters and TLC to name a few of the bands that grace this soundtrack. The beauty of the soundtrack is that each team has their own theme song that plays during the match to help get gamers into the atmosphere of the title. The game also contains the usual sounds of soccer such as kicks, head buts, blocks and even the sounds of traffic and the police. Urban Freestyle Soccer is a great game that I would highly recommend to all soccer and sport fans that require something "different" in their sporting diet. With an amazing graphics engine that not only looks pleasing to eye but also plays extremely well, it also contains a great multiplayer option that will give players endless hours of fun. Recommended!